Japanese Gyudon companies try to develop domestic market with expanding overseas! The market size of food service industry in Japan is about 25 trillion yen, it of Gyudon is about 40 billion yen. The three compnies occupy Gyudon market in Japan, Matsuya Foods, Yoshinoya and Zensho. Japanese Gyudon companies try to develop domestic market with healthy food. Gyudon is Japanese traditional dish made with stewed beef and rice. It was born when Japanese began to eat beef in Meiji period(1868-1912). Gydon is well known as fast, cheap and delicious dish in Japan. The price of curry and rice which was also called Curried rice was five sen(about five cent in USA) aound 1890, but the price of Gyudon is one sen then. The first Gyudon chain store was born in 1899. 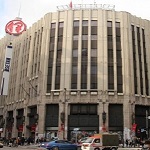 Eikichi Yazawa opned it in Nihonbashi, and named it as "Yoshinoya" because he was born in Yochino city in Osaka. People called it Gyu-meshi before Yoshinoya called it Gyudon. Gyudon name became popular as Yoshinoya grow. On the other hand, Matsuya which is one of the largest Gyudon chain called this dish Gyumeshi stubbornly. The market size of food service industry in Japan is about 25 trillion yen(about 250 billion dollars) according to the report of Japan Foodservice Association in 2017. The market size of Gyudon is about 40 billion yen, that is larger than market size of Sukiyaki, Gyoza and steak restaunrant. That is smaller than the Humburger's and Sushi's market size, but Gyudon market is one of the largest food service in Japan. The three compnies occupy Gyudon market in Japan, Matsuya Foods, Yoshinoya and Zensho. Matsuya, Yoshinoya and Sukiya which is operated by Zensho are called the big three Gyudon chain store. The sales of them and Gyudon price are used as an index concerning economic performance in Japan. Comparing with three major Gyudon companies' sales, Zensho's sales is much larger than other two companies. Zensho operates not only Gyudon chain stores but also other restaurant, Sushi, Ramen, Steak restaurants. The only Gyudon sales of Zensho is about 200 billion yen. On the other hand, the only Gyudon selas of Yoshinoya is about 100 billion yen, it of Matsuya is 80 billion yen. The Gyudon sales of Zensho is twice of other two companies' sales, but Zensho has not only Sukiya but also Nakau. Zensho bought Nakau from Sojitz Corporation in 2003. The number of Gyudon stores in Japan, Sukiya has 1963 stores, Yoshinoya has 1207 stores and Matsuya has 943 stores. The number of their stores is in direct proportion to their sales. The number of Sukiya stores overcame the number of Yoshinoya stores in 2008. The number of Sukiya stores trends to decrease slightly though it increased from 2013. The number of Yoshinoya stores decreased slightly from 2010 earlier than Sukiya. The number of Matsuya increased rapidly around 2011, but it also decrease slightly now. The race of increasing stores was already over in Japan. However, overseas Gyudon market is different from domestic Gyudon market. Yoshinoya is very proactive in expanding overseas. It has over 700 stores in the overseas, China, Indonesia, Thailand, Malaysia and USA. Especially in China, it operates over 200 stores. On the other hand, Sukiya has only about 70 stores, Matsuya has only seven stores in the overseas. Japanese Gyudon companies try to develop domestic market with expanding overseas. They think healthy food is a key for them to do that. 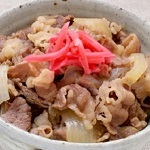 Many Japanese think Gyudon is a fast, cheap and delicious dish, but it is not healthy. Yoshinoya sells Gyudon including SALACIA which is used as a treatment for diabetes in India. SALACIA Gyudon is food restaurant industry's first functional food approved by Consumer Agency in Japan. In addition, Yoshinoya sells Peptide Gyudon for people who are on a diet and GABA Gyudon for people who care hypertension. They are sold through only online shopping. Sukiya also think healty Gyudon is important, but does this in a different way from Yoshinoya. Sukiya sold some Gyudon topped with healthy food for a limited time one after another. For example, it sold Caesar lettuce Gyudon which is a Gyudon topped with Caesar salad, Oni-sala Gyudon which is a Gyudon topped with onion salad, Gyudon light which replace rice for tofu(soybean curd) for decreasing carbohydrate. Matsuya Foods(TYO:9887), Yoshinoya(TYO:9861) and Zensho Holdings(TYO:7550) are listed on the Tokyo Stock Exchange. Foreign investors can invest in them through many ETFs, iShares MSCI Japan ETF(EWJ), Wisdomtree Japan Hedged ETF(DXJ) and more. 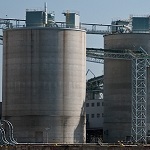 Many Japanese companies increase their sales and profit with weak yen. If investors want to hedge an impact of fluctuations in foregn exchange rates, they can invest Japanese companies through currency hedged ETFs, Deutsche X-trackers MSCI Japan Currency-Hedged Equity Fund(DBJP) and iShares Currency Hedged MSCI Japan ETF(HEWJ).